It's been a busy pre-spring, with a couple trips that I haven't even had time to properly reflect upon here, as well as work and house projects. The house projects have taken a front seat lately since I actually have people living with me now. It's one thing to live in squalor by yourself. 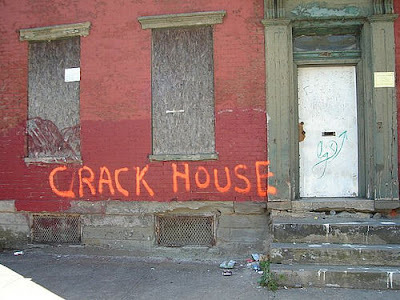 Don't get me wrong - residing in a minimally reconditioned former crack house is often interesting and exciting. You never know when you'll find a weapon hidden under the floorboards, or perhaps a vial or some historically significant drug. You can also have hours of fun playing "CSI" with the random stains on the carpets -- it's like having your very own murder mystery to solve! But at the same time it's kind of a turnoff to company... especially female. And when people are paying you rent, you feel bad about certain things that maybe you were OK with when it was just you. Like having a functioning shower. Sometimes it's just a matter of taste, though. For example, I have created in some cases wonderful architectural details that in high society we refer to as "exposed bricks and joists." While I am slightly insulted when someone asks why a room has "no walls or ceilings," I am willing to forgive such ignorance. So I am generally working on the projects for at least an hour or two each night after work to keep things moving, as well as the weekends. This has definitely had an impact on my drinking time -- it's pretty hard to get inspired to go out at 10 PM on a Tuesday when you've gone to work all day and then put up drywall for three hours after that. But at the same time it's satisfying to see things taking shape at last. The goal is to get the Petworth place in good enough shape to refinance at a lower loan to value ratio, while interest rates are ridiculously low. Of course, that could be the case for a year or two, but I also need to make sure that my improvements outpace the decline in property values. It's a dangerous game, but hey, I live on the edge.